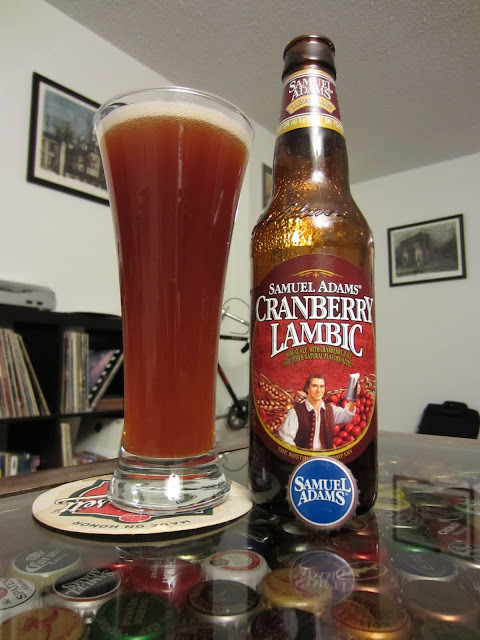 After posting reviews for a number of true Belgian Lambic ales I saw fit to post my review of the Samuel Adams Cranberry Lambic. This Boston take on the style features a cloudy browning body with a distinct red tint and minor glow. This very-hazy beer musters a medium, but still smallish head of a lightly pink foam. The head is short-lived and leaves very little lace behind. The nose features cracked grain maltiness with a moderate sweetness and a light astringency. Tart cranberries are present, but light, and the beer leans stronger toward sugars. 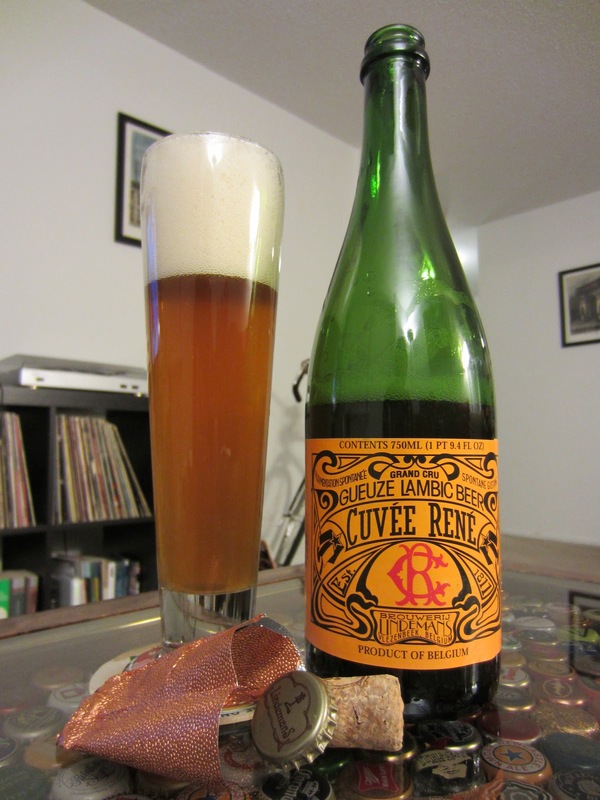 The beer is quite crisp, but doesn't match the Champagne-like mouthfeel of a true Lambic. In fact, this beer seems to have nothing to do with the style at all. Without a process of spontaneous fermentation or at least using a blend that includes some wild yeast strains it is hard to imagine any beer successfully mimicking the style. Cranberry flavor is light, moderately tart, and features some sugariness. The beer is sweet, but not cloying. The underlying malts matched with the beer's sweetness give the impression of a light toast with maple syrup. The finish is mild overall with a lasting toothsome sugar. 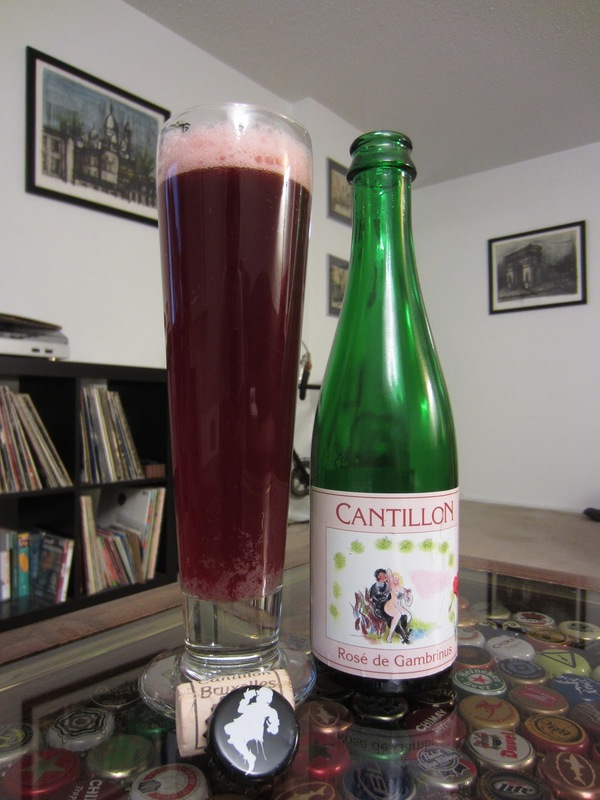 Through a multiyear process of fermentation and blending Cantillon produces fruit beers that boast massive fruit favors, but keep a definitive dry edge. As a result, this Framboise stands out from the pack of other raspberry or fruit beers. The body is a hazy brownish pink with a mild copper glow. The head is a thick light pink foam, creamy and dense. The head retention is excellent in the plastic cup and leaves tons of lace. The nose is strong and bitingly tart. The sweet and fruity nose seems to burst with raspberries and offers up a sublime cellary funk. The beer is cheek-pinching and puckers up the face immediately on the first sip. The beer is sweet with huge fruit, but not overly toothsome. The sour Lambic base provides combination of earthiness and light malt, but the grain seems completely overpowered. The textured carbonation is bristling and bright with a Champagne-like consistency. The beer is delicious and sweet. It is a fruit beer on the world class level. The finish is just as tart as the foretaste and the sweet fruitiness lingers with a hint of sugar. The second call back in my Lambic series is to the Faro Lambic from Lindemans. Faro is perhaps the least common of the general categories of Lambics in the United States. Traditionally Faro was a cheaper beer, traditional Lambic, cut down with another beer, or water, with added sugar for sweetness. Today most Faros are not cut with non-Lambic beer, but still feature the addition of unfermented sugars. Typically lighter in alcohol, these beers match some features of Lambics, but depart slightly. In my review, I gave Lindemans Faro a "B," which I am still comfortable with, although, if anything I would consider bringing it down half a point to "B-" because, while enjoyable, it is not a beer that I would readily reach for. I mentioned that the beer features a "classic Lambic funk, but it is attenuated by the addition of Candi Sugar, which adds a prominent sweetness." The beer is perhaps an entry point for new Lambic drinkers, as it introduces the palate to the very diverse world of wild yeast, but it is not a world-class example, so I am a bit hesitant to recommend it fully. Perhaps the fruit Lambics provide another entry place to sour beers, albeit very different given the extreme fruitiness, which masks, at least partially, the underlying Lambic flavors. Click through below to read the full review from February 2012. While Lindemans is most famous in the United States for their fruit Lambics, they also produce Faro, a lower-alcohol Lambic, and their grand cru, Cuvée René Gueuze. Cuvée René pours a tall yellowy amber body with free-floating yeast. A careful pour leaves just a fine suspension of particles from this unfiltered beer. The head is a medium-sized yellowed white. The lightly textured foam dissipates slowly, leaved layers of chunky lace behind. The nose is incredibly tart with a dry spiciness and lightly floral hints. Dusty aromatics evoke the age and cellaring of the beer. Sugary sweetness underlies the darker tones and is matched by light sour apple notes. Cheek-pinching tartness up front is paired with customary Champagne-like bubbles cascading in layers of strong carbonation. The beer is slightly spicy, but features a smooth malt backbone. Heaps of fruity sweetness evoke mild apricot flavors, a dash of grape juice and the bite of a tart apple cider. Metallic notes on the finish tie together the beer's diverse palate for a sparkling and clean feel. 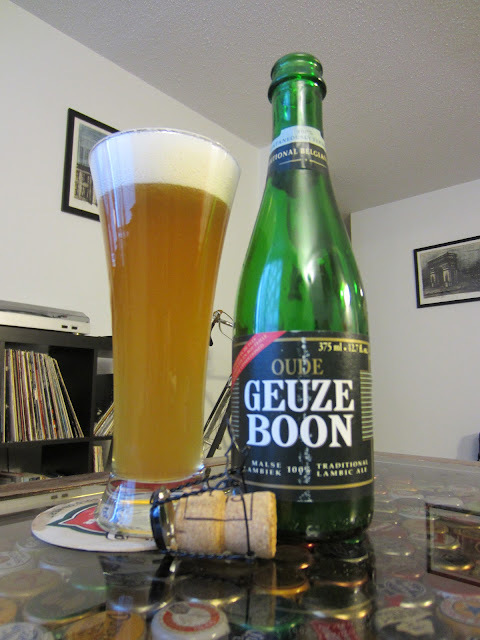 As part of this developing series on Lambic ales, and later a few additional sours, I thought it would be relevant to call back to a few previous reviews. First on the retrospective list is the Oude Gueuze from Hanssens Artisanaal. Hanssens is a veritable 'mom and pop' operation running in Dworp, Belgium blending excellent Lambic ales using vintage equipment on a part-time basis. Their Gueuze, and their other Lambics as well, have a reputation for extreme tartness, and my experience has been no exception. Looking back on my review, where I called the beer "extremely fruity and considerably tart," I think I could possibly switch those adverbs around. While attending Zwanze Day 2012 (a celebration of Lambics featuring Cantillon beers, but others as well) I had the pleasure of drinking Hanssens Gueuze from a cask. The experience was not for the feint of heart, or the unitiatied Lambic drinker. In short, I had never had such an overwhelmingly tart beer. I continue to recommend Hanssens Gueuze as an excellent beer at a great, affordable price. Well deserving of my highest "A" rating. While not found everywhere, specialty beer stores often stock it. I would also recommend Hanssesns Experimental Lambics, which feature fruit blends both common and uncommon. These, however, can be much pricier than their Oude Gueuze. Click through below to read the full review from September 2011. The Boon Brewery, based in Lambeek, Belgium produces a number of Lambic beers through spontaneous fermantation. Among their beers is Oude Gueuze Boon, a traditional Gueuze produced using wild yeast and the blending of variously aged Lambics. The beer pours a cloudy straw body with rapidly rising carbonation. The pour produces a large, frothy, off-white head with excellent retention. As the foam fades it leaves swathes of white lace on the glass. Sour funkiness great the nose. The aroma is very tart with sweet grapes and a moderately spicy edge that hints at malted wheat. This highly carbonated beer dances on the tongue with effervescent Champagne bubbles. The beer is earthy up front with farmhouse flavors of turf and straw. A big cellary funk puckers the palate as it reaches the back of the tongue. The sweet juice of grapes and golden pears round out the mid-palate. A light metallic edge comes in as the initial wave of funk subsides. The finish is very dry with a sour apple juice flavor that lasts on the aftertaste.